Collectors, writers and purveyors of American art have long debated the purest essence of art. Is it a free-wheeling Jackson Pollack drip painting or a solitary building in a Maine landscape by Andrew Wyeth? The answer always lies in the eyes of the beholder often enhanced by the analysis and vision of the writer. How else could Damien Hurst get $4M for a shark in formaldehyde? Russian art discussions have recently begun to mirror that American landscape. While we consider the debate to be great verbal sport, many support their chosen position with extraordinary vigor. As contemporary Soviet Social Realism/Impressionism/Official Art gets more press, more books and more shows; it challenges the supporters of Soviet non-conformist art. Sometimes words are written around what we have in inventory, sometimes the words come from our experience, and sometimes they come from the heart. Our marketing background knows that all these words can improve arts visibility and support arts education and investigation. We applaud The Museum of Russian Art for taking the debate head on with their show opening April 20th. Soviet DisUnion – a show of eighty works featuring both social realist and non-conformist art. We will continue to support the period we have come to love and understand. However, if we have a significant lottery win, we could add a nice Kandinsky to our mix. We have recently acquired a very good Alexei K. Sokolov of a Spanish dancer. He painted this work in Paris in 1960. We have also acquired an excellent work by the Tkachev brothers from the collection of an English diplomat (diplomats downsize too). The new issue of Art and Auction has features on both Chinese and Russian art and how opening up their markets to collectors is changing the international art scene. The Russian article also addresses a question that comes up regularly. 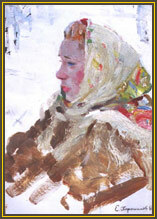 “Why does Russian 19th Century art look much like other European and American art?” The answer is the Czarina staffed the academies with European instructors. The flamboyant and irascible artist Whistler studied drawing at the Imperial Academy of Science in St. Petersburg when his family lived in Russia. We think the new Sokolov book is on the water, so we should have it in May. If you have questions or comments regarding art, please let us know.